Rigoberta Menchu was awarded the Nobel Peace Prize in 1992 when she was 33 years old. Rigoberta was brought up in the Mayan religion by her mother and in the Christian faith by her father in a Guatemala village. She began working on coffee plantations in southern Guatemala at the age of eight. By the time she was twelve, she was already involved in the struggle for human rights for Guatemala's indigenous people. She recalls, "My father used to say: I am not forcing you to stop being a woman, but your participation in the struggle must be equal to that of your brothers." 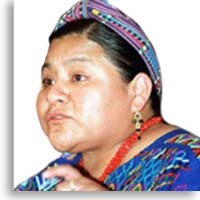 Rigoberta's village was burnt and her mother and father violently killed. The Civil war in Guatemala, resulted in the deaths of 50,000 - 100,000 people and the disappearances of more than 30,000 people. Rigoberta's sisters joined the guerrilla forces. Rigoberta instead developed her skills as a writer, speaker and human rights activist. Forced to flee from Guatemala to Mexico in 1981, she continued to advocate justice for her people: "A hungry people is a people without peace. If the demands of the people are not met, what kind of peace are we talking about?" Her work with refugees from Guatemala, her organisation of many women's groups and her utter dedication to the cause of indigenous people everywhere, won her the Nobel Peace Prize. In 1993, the United Nations appointed her Ambassador of Good Will for the International Year of Indigenous Peoples. She returned to Guatemala and played a part in the negotiations which lead to a treaty between the government and the guerrilla forces in 1996. However she remains as uncompromising as always in the struggle for justice, believing that: "Silence is also part of repression".